I should have gone in June or July! 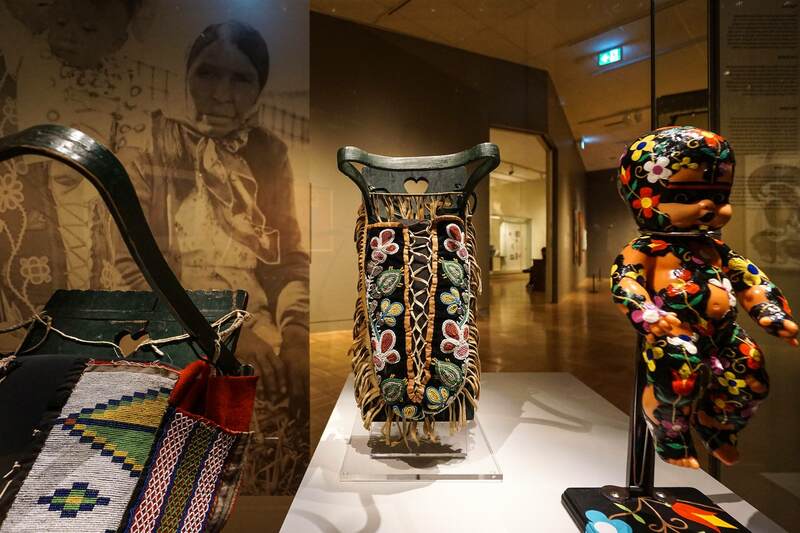 The Royal Ontario Museum hosted an exhibit (June 17 to November 19, 2017) titled Anishinaabeg: Art and Power which recently closed. Sad to say, I forgot all about it until the day before the show closed. 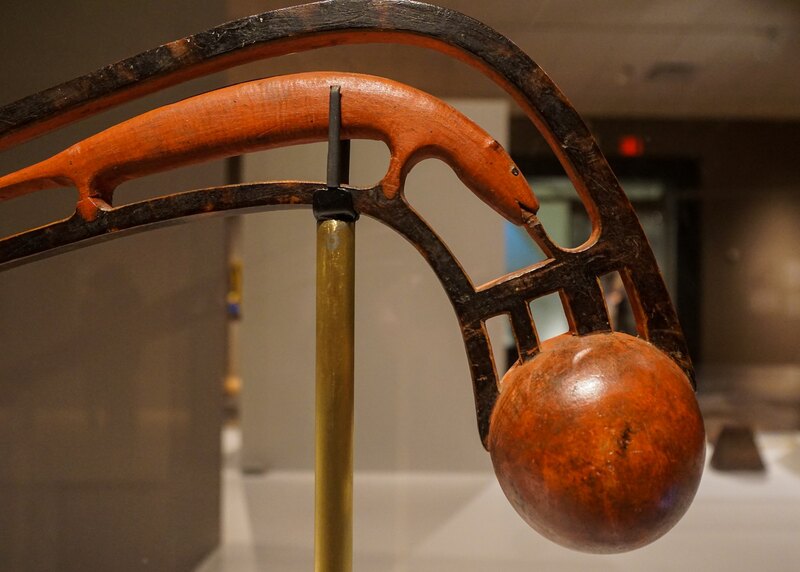 That morning a Toronto Star article on the return of Indigenous artifacts was what prompted my memory. 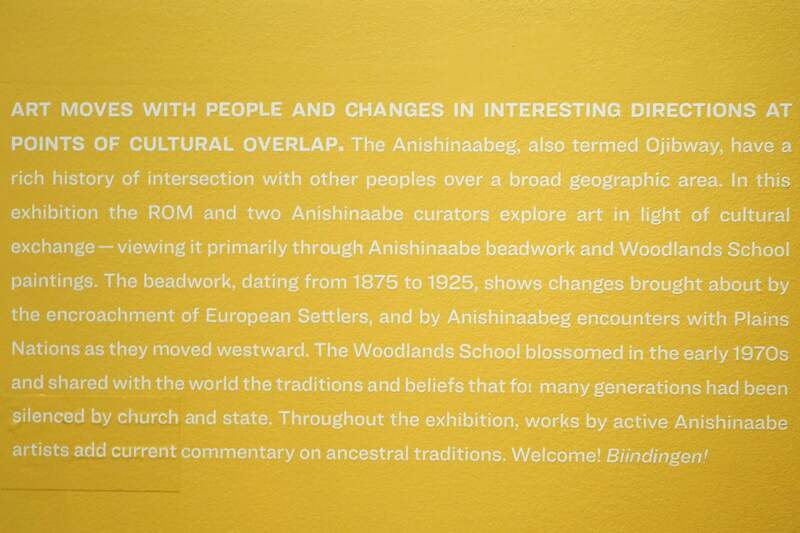 The first stop was the third-floor room which housed the Ojibwe exhibit. 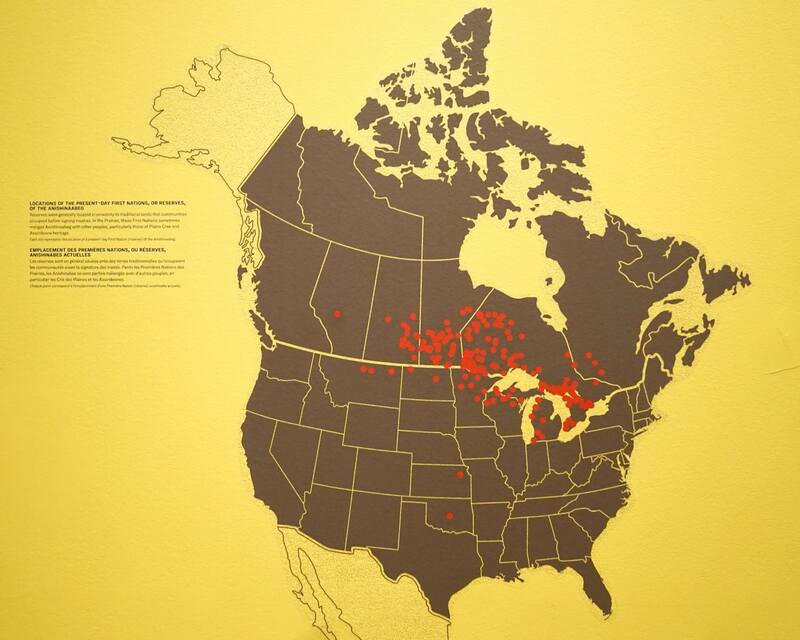 There were a couple of entrances to the room; one of them featured the following map showing the locations of present-day Algonquian peoples spread across the boreal forests in the Shield country of Canada and the northern U.S. – e.g. 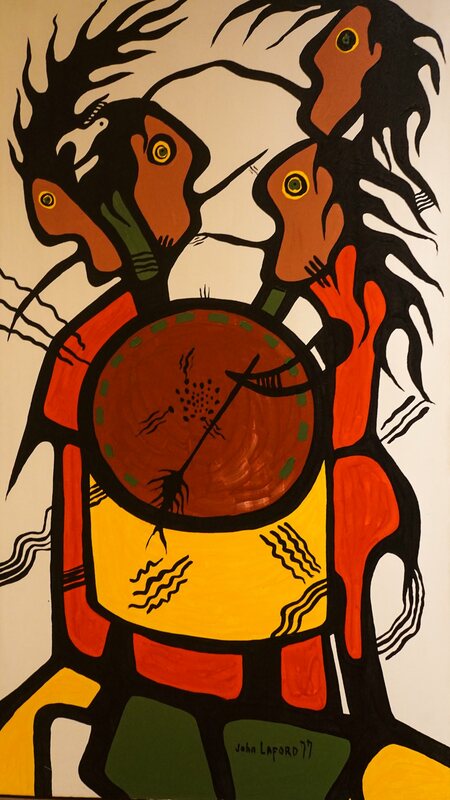 from the Algonquins in Quebec to the Mississauga, Ojibwe, Ottawa and Oji-Cree in Ontario, all the way to the Blackfoot and Cheyenne out west. 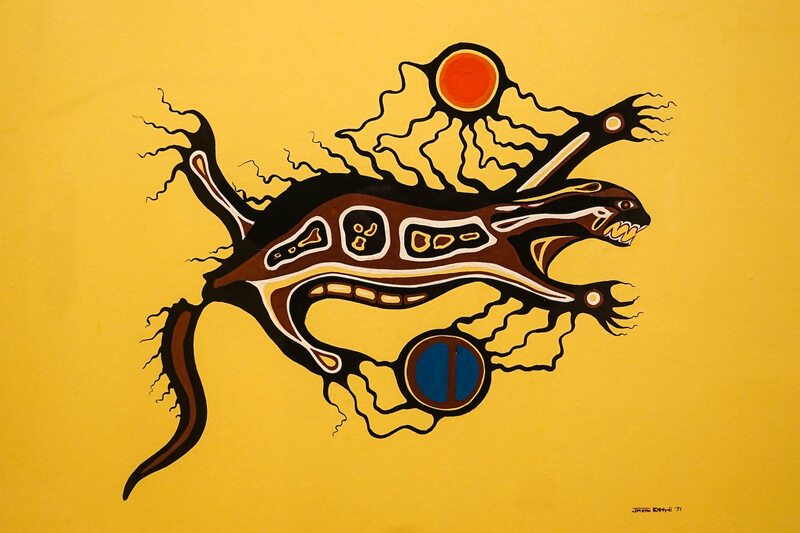 So – beadwork dating from the 1870’s to 1925 and paintings mostly from the 1970’s by Morrisseau and those he inspired. It was a narrower focus than I had been expecting and left me wondering about the word “power” in the title of the exhibit. “Adaptation” seemed to fit the rationale better. 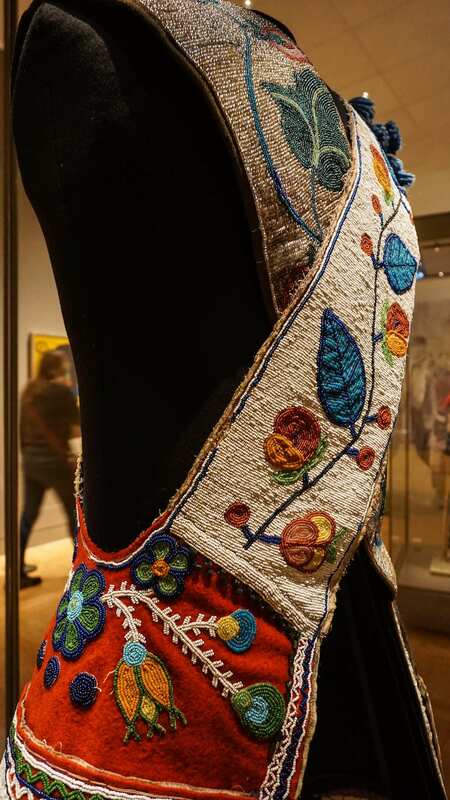 Above and below – details from the beadwork and painting on display. Except for a Saul Williams’ painting, the two art forms did not converge! 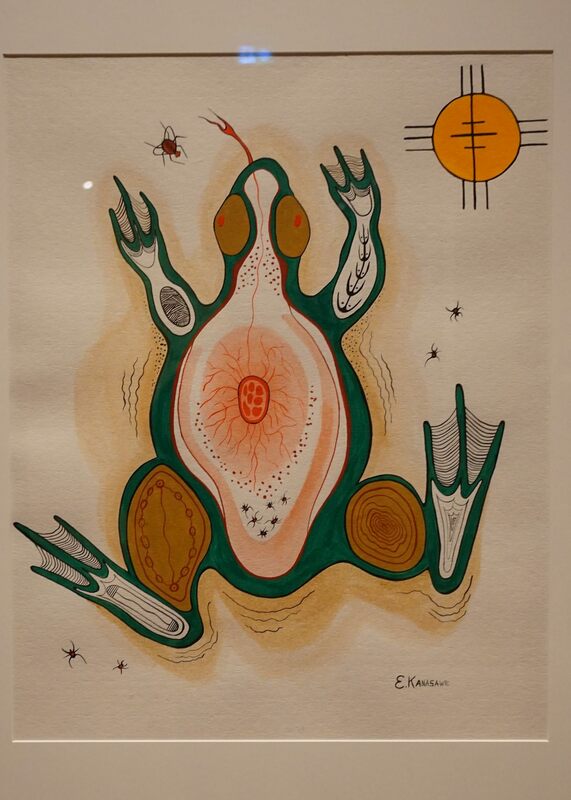 The exhibit was set up with the paintings – about thirty of them – on the periphery of the room. 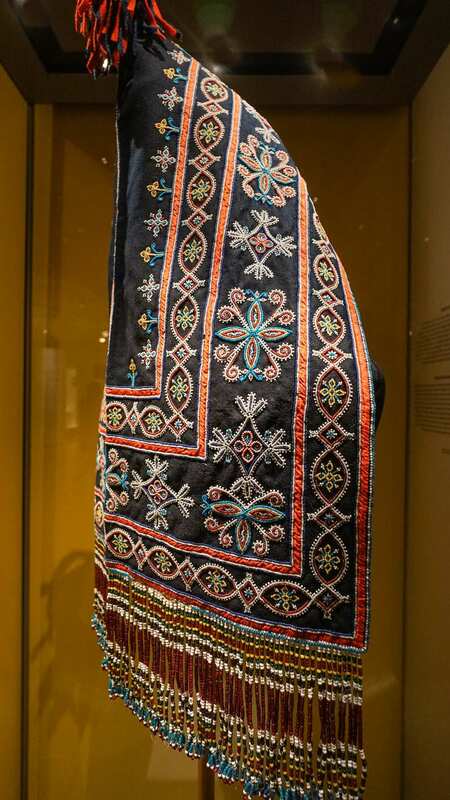 The beadwork was highlighted in the vertical showcases, like the one in the image below, containing headless mannequins draped with sashes and bandoliers or wearing heavily beaded jackets. 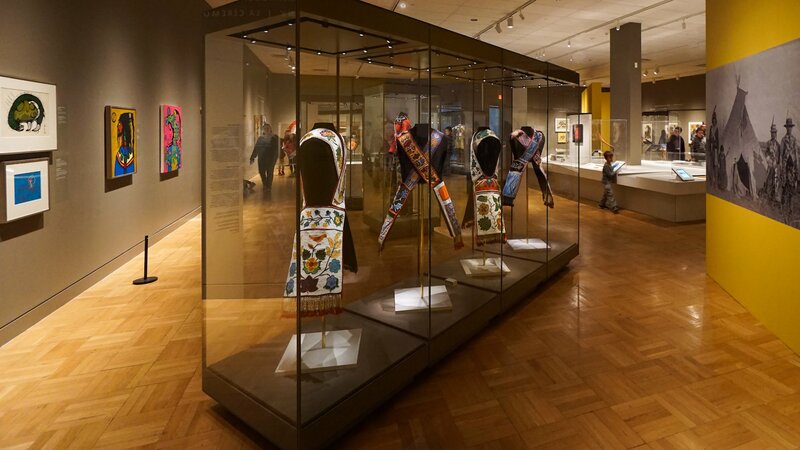 Anishinaabe display-set-up: paintings on the walls and beadwork in vertical display cases. 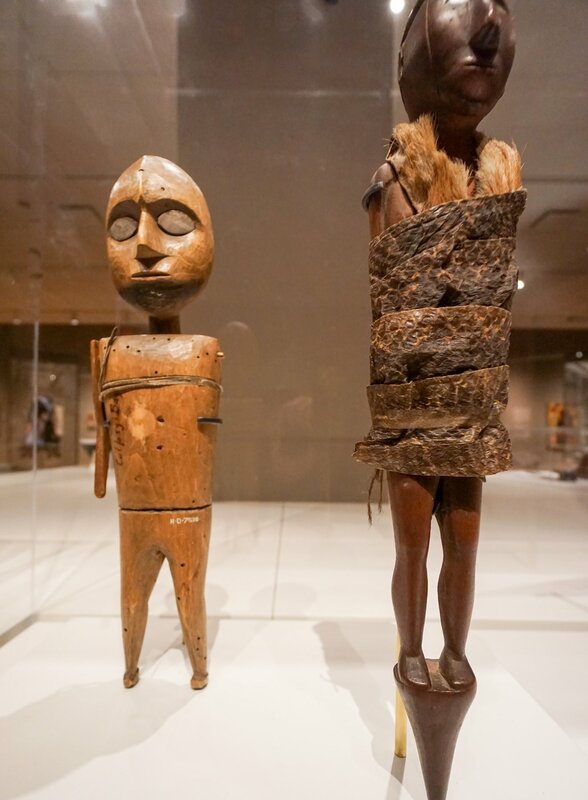 In the center of the room was a horizontal display case area with various objects – carved dolls, a ceremonial club, among other items. The paintings were grouped by themes but I didn’t really focus on that while I did my tour around the room. 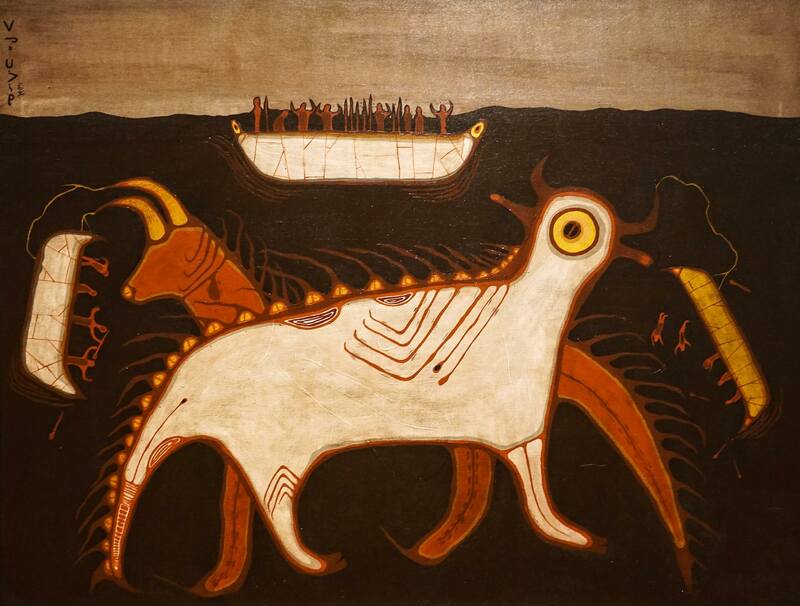 The curators arranged the ones in the image below with “Ceremony” as the unifying theme. “Hurt”, “Creation” and a few other titles had images grouped under them. 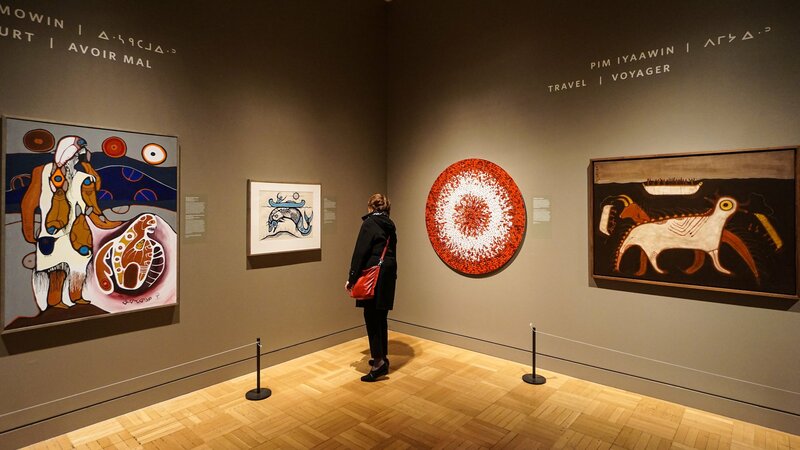 Occasionally objects in the central display area would echo in the paintings on the wall. 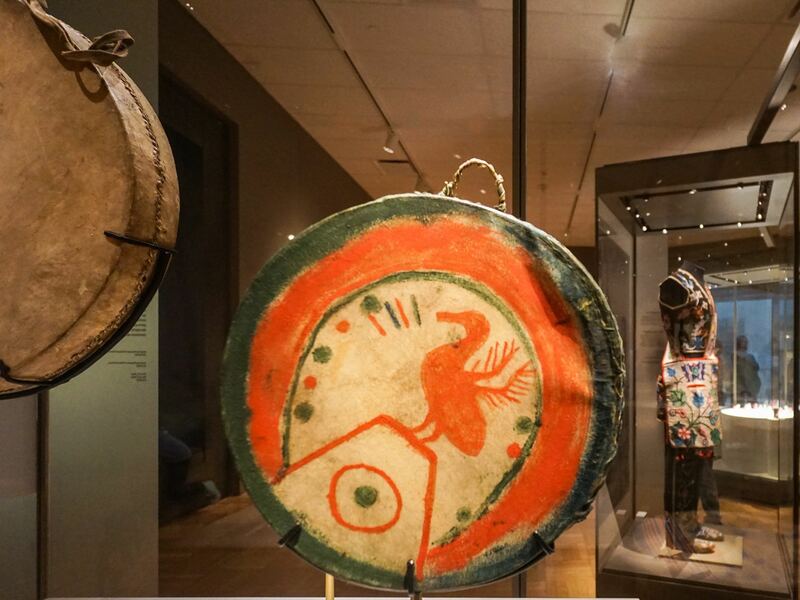 The display of ceremonial drums made me look again at John Lafort’s painting Drummer. Along with different themes connected with various painting groups, there were a number of panels like the one below. 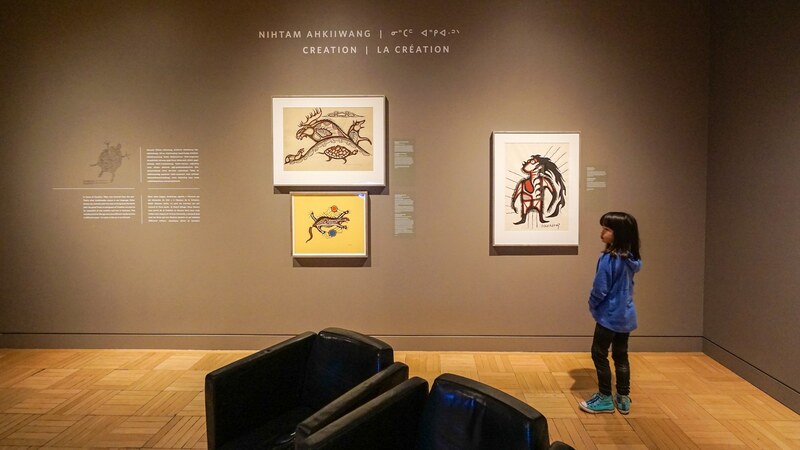 Each was divided into four parts with an iconic pictograph on the top left (perhaps one of the many sketches taken from the ROM’s Selwyn Dewdney files) and an explanation of traditional Ojibwe culture or spirituality in English, Ojibwe, and French. 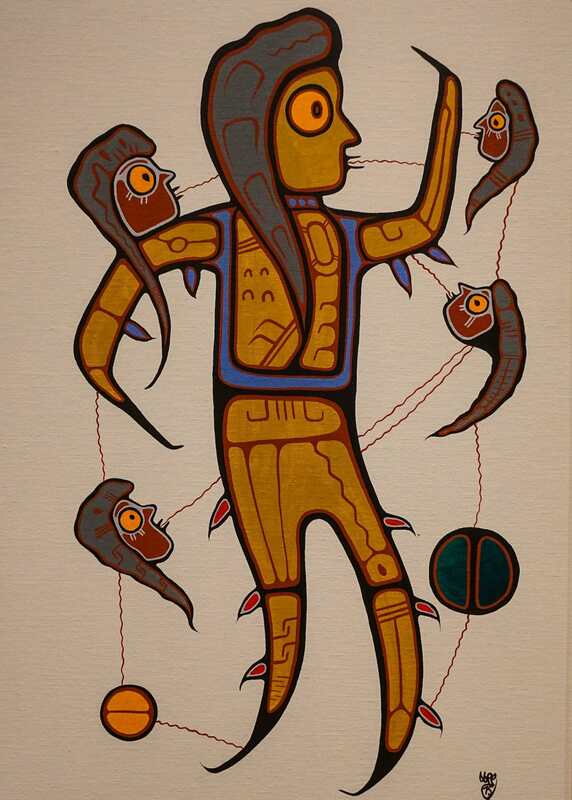 Thunderbird Man by Daphne Odjig. 1974. Untitled. John E. Laford, 1973. Sometimes the explanatory text sounded like simple parables written for ten-year-olds. And perhaps it was. 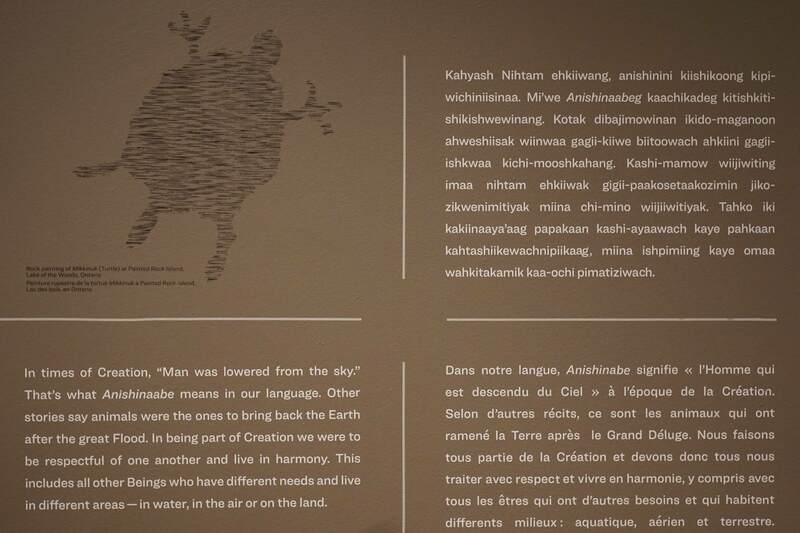 Reaching out to indigenous students and providing them with an affirmative vision of themselves and of their past and future must have been one of the goals of the exhibit, even if not explicitly stated. 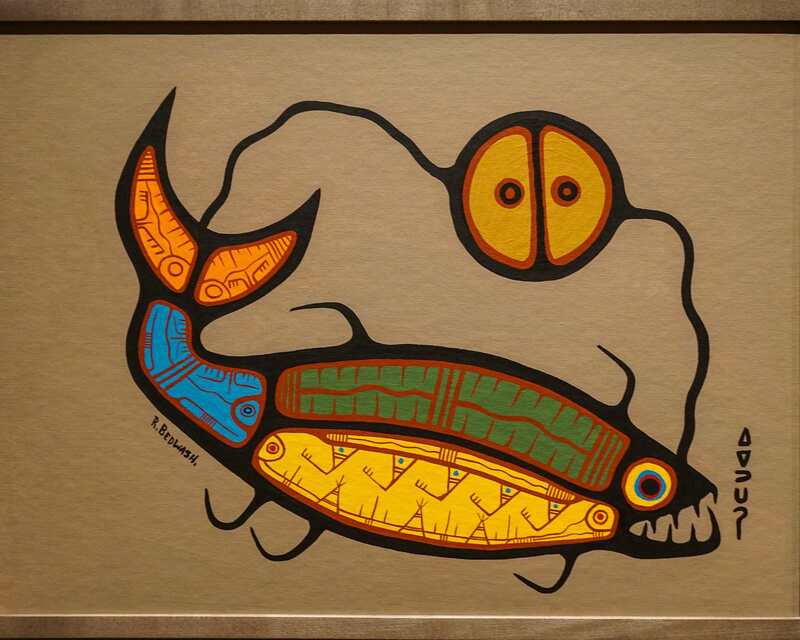 Sacred Trout. Richard Bedwash. 1988. Mother Nature and Woman. Roy Thomas. 1970. One Who Lives Underwater. Blake Debassige. 1978. Meditations on Red. Nadia. Myre. 2013. 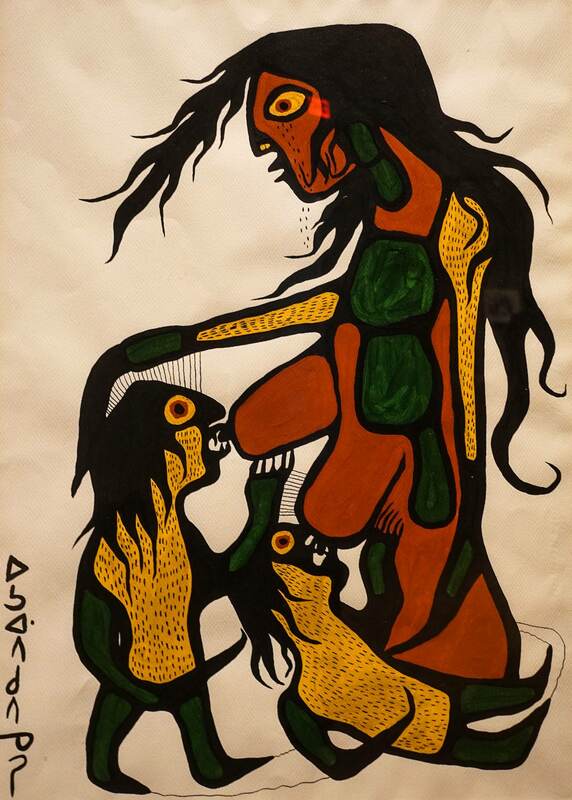 Woman In White Buckskin.Blake Debassig. 1976. 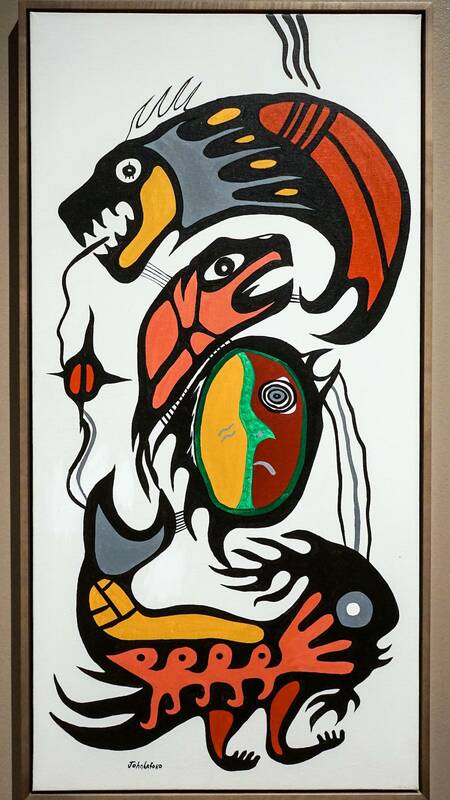 Of the various paintings, the ones I was most drawn to were those by Norval Morrisseau. 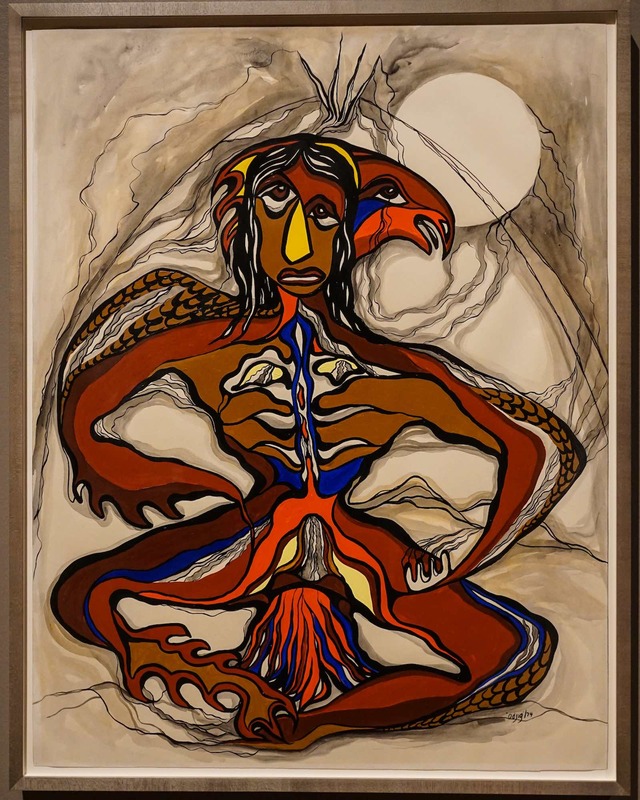 While the exhibit’s mission statement used the term “artistic evolution” it seems rather mild to describe Morrisseau’s explosive impact. How about “revolution”! 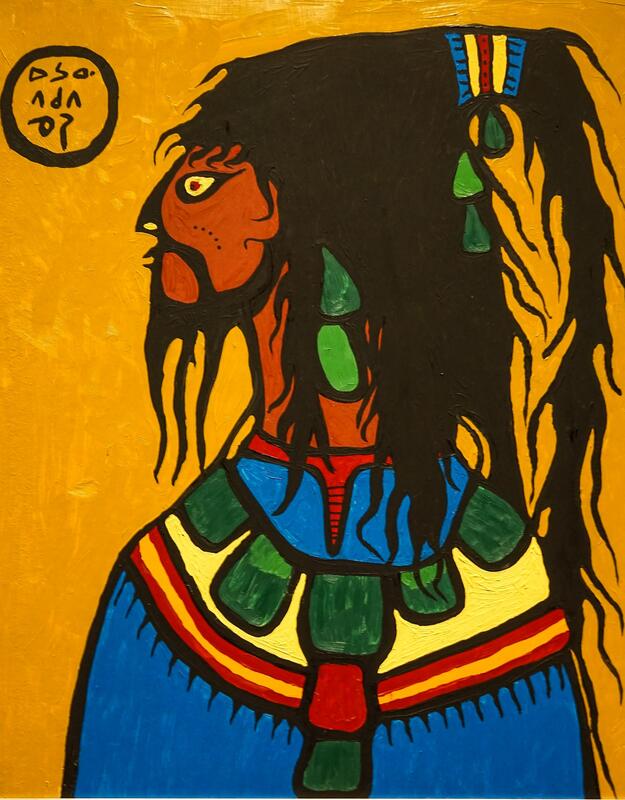 He created something unique from the rudimentary pictographs he saw and used it to infuse new life into the traditional myths and legends of his people, the Ojibwe. 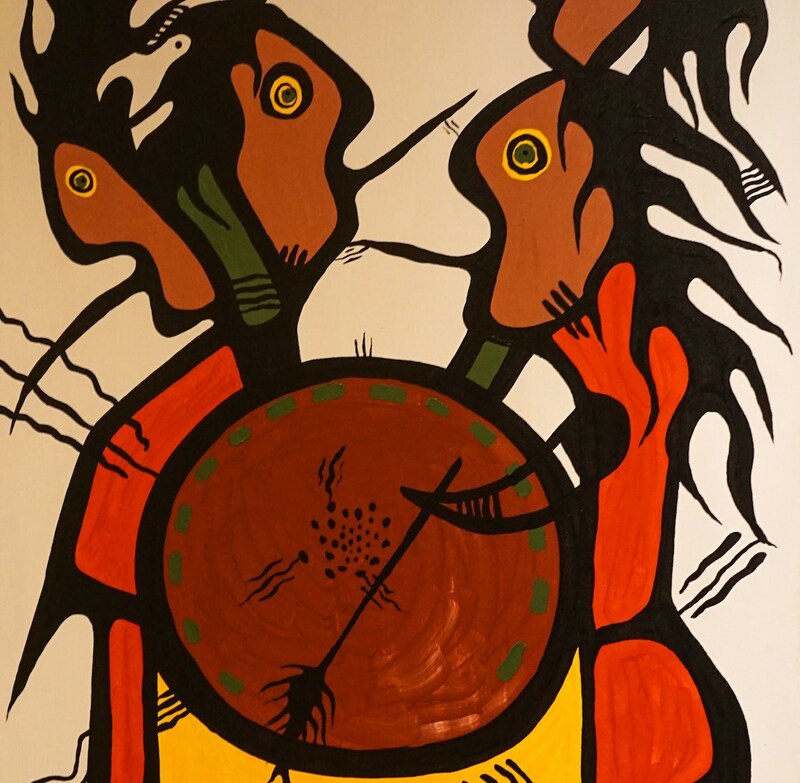 He drew on the stories he heard his grandfather tell on the shores of Lake Nipigon when he was a boy. Had he listened to the elders he would have put the paints away. 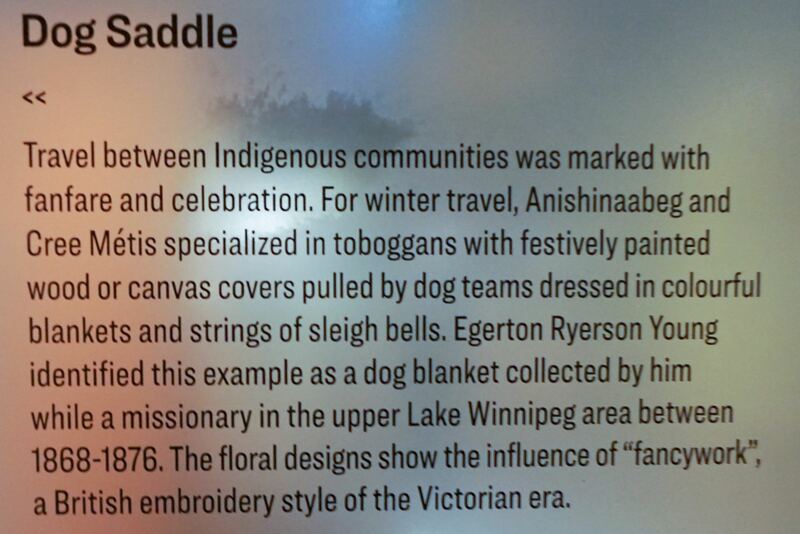 It was the encouragement of non-indigenous people (the current term to describe them is “Settler”!) like the Weinsteins in Cochenour and Selwyn Dewdney in London who kept him expressing his vision on canvas and whatever else he could find to paint on. 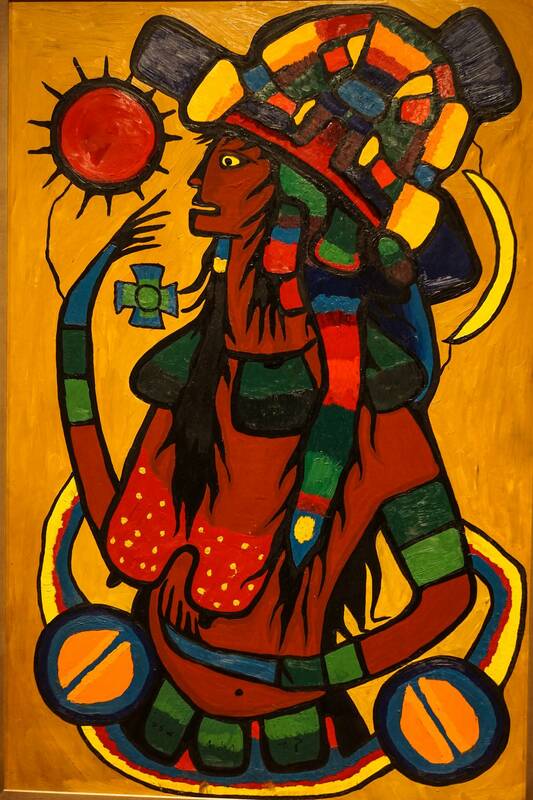 Thunderbird Woman. 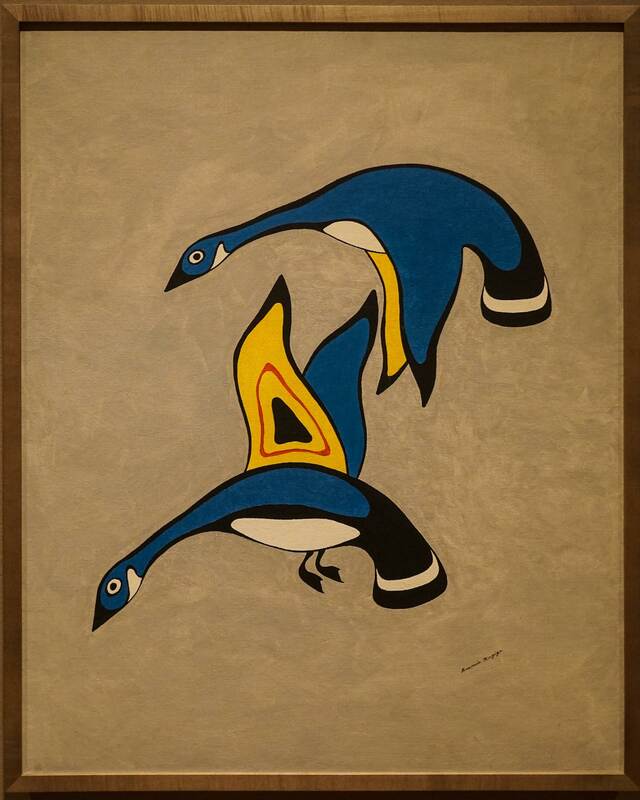 Norval Morrisseau. 1965. 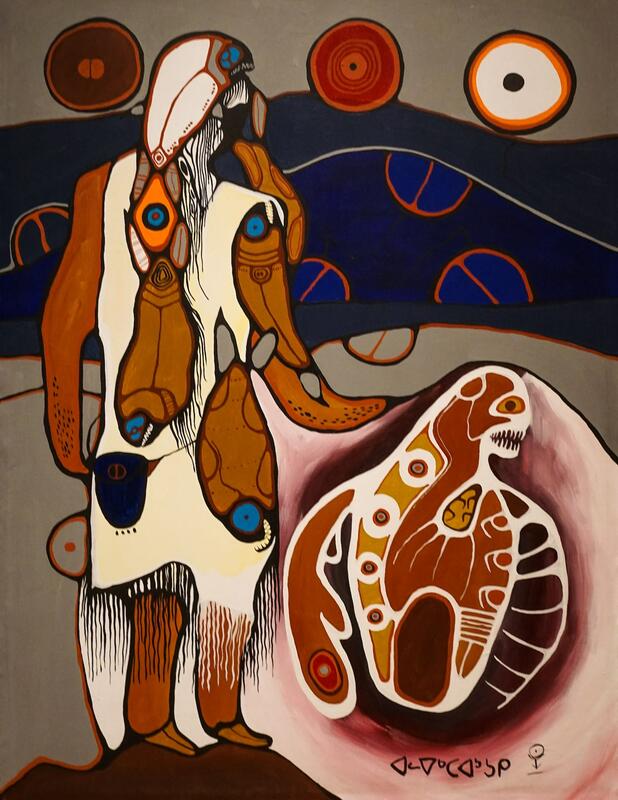 If there was one painting in the exhibit that tied together the Morrisseau-style paintings with the floral beadwork of Anishinaabeg women it was Saul Williams’. 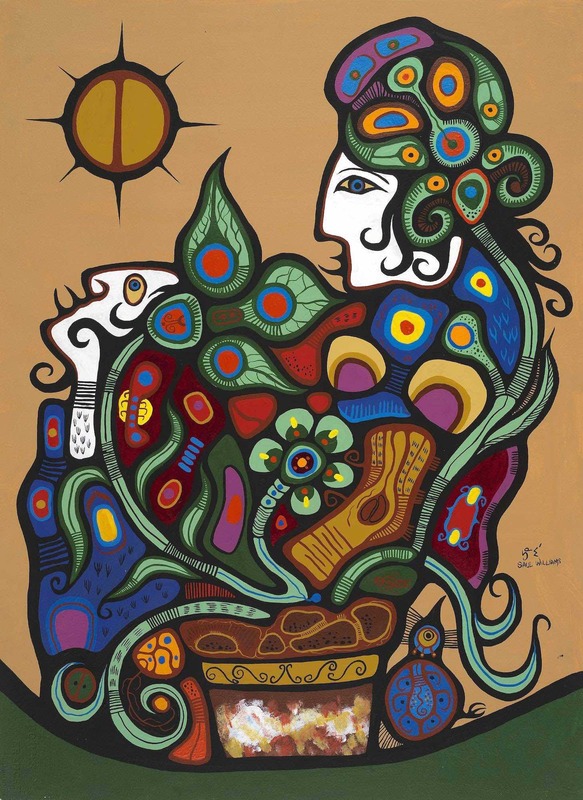 It has the iconic Morrisseau circle overlooking the scene – I almost expected to see the cosmic lines connecting it to the plants and the woman! 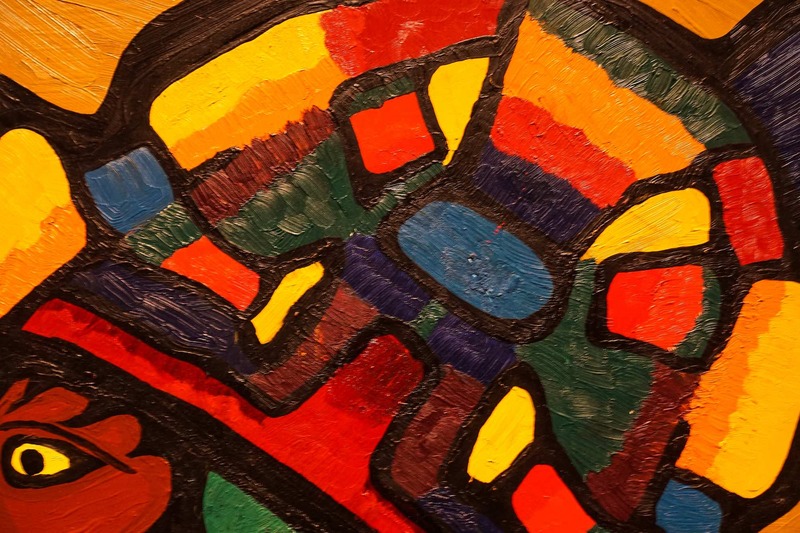 And while it has some of that x-ray view of reality found in Morrisseau paintings, the look takes more from the floral beadwork. 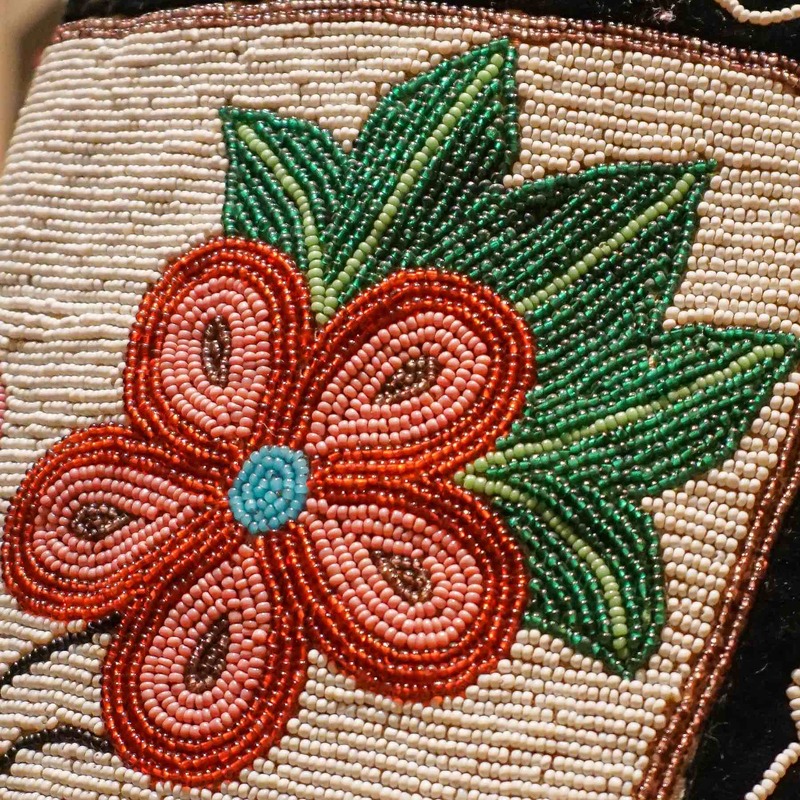 It even shares the same more muted colour palette as many of the examples of beadwork in the room. White Women and Their Plants.Saul Williams.1978. 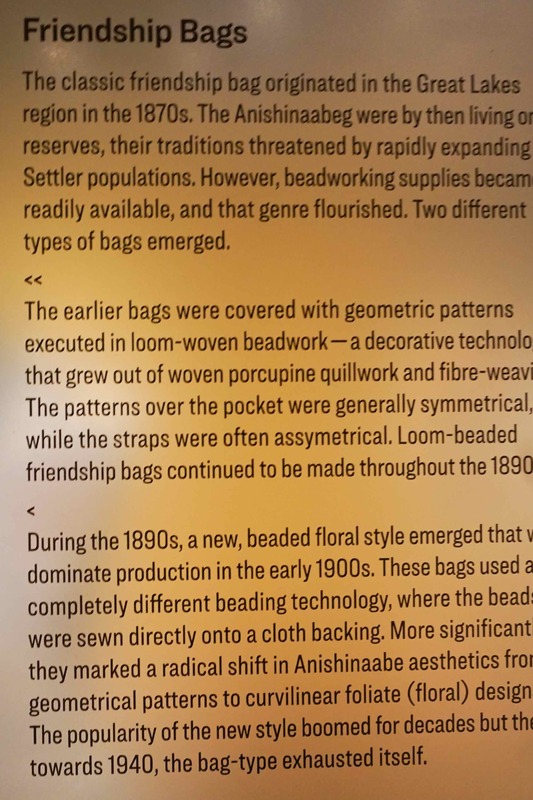 Something I did not think about while I was there was what preceded the use of European glass beads. 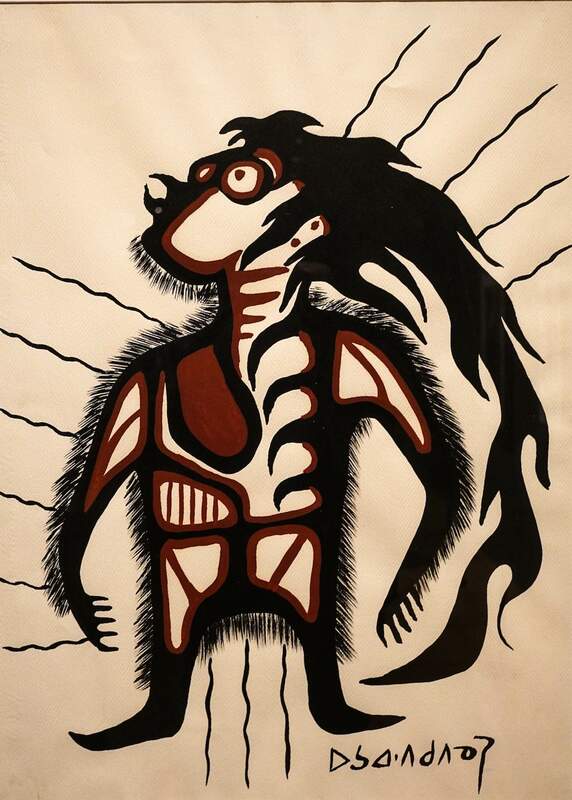 Since the aim of the exhibit was to take me ” on a journey through the artistic evolution of one of the most populous and diverse Indigenous communities in North America” I missed seeing examples of the traditional pre-contact porcupine (and occasionally feather) quillwork. There may have one or two examples that I did not focus on. 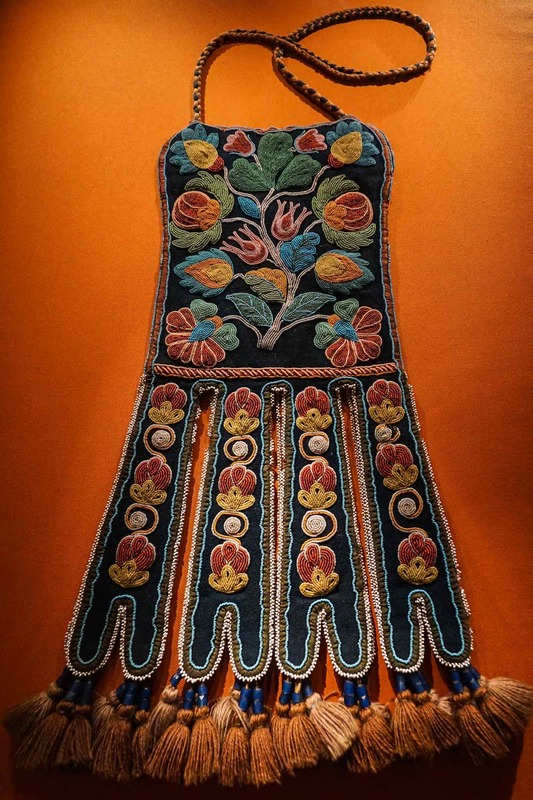 Perhaps I just have an easier time with the artwork on the periphery of the room than with the examples of beadwork which dressed a number of headless mannequins in glass display cases, as skillfully and creatively as they were done. This may have been a great time to have a guide who could point out stuff and connections that I would never see or understand on my own! 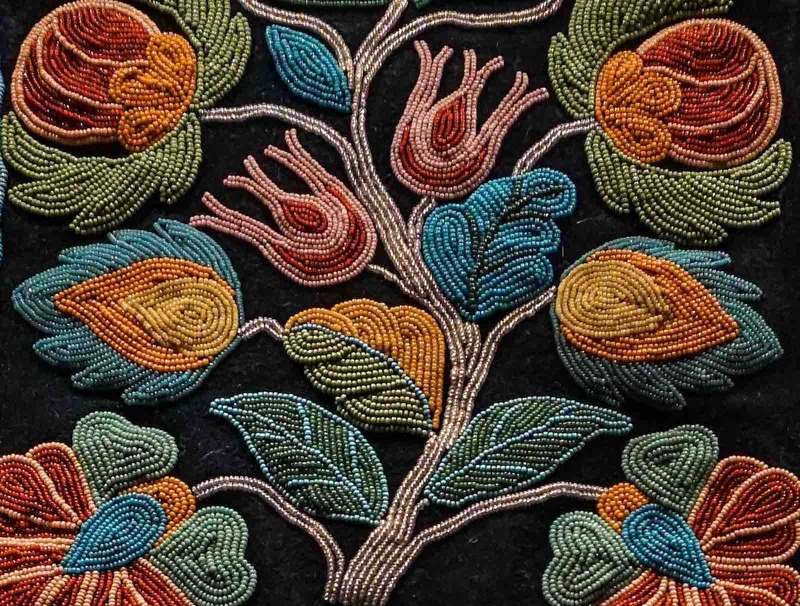 – but other than that it was mostly either geometric or floral (and sometimes florid and overly busy in a Victorian kind of way) patterns. 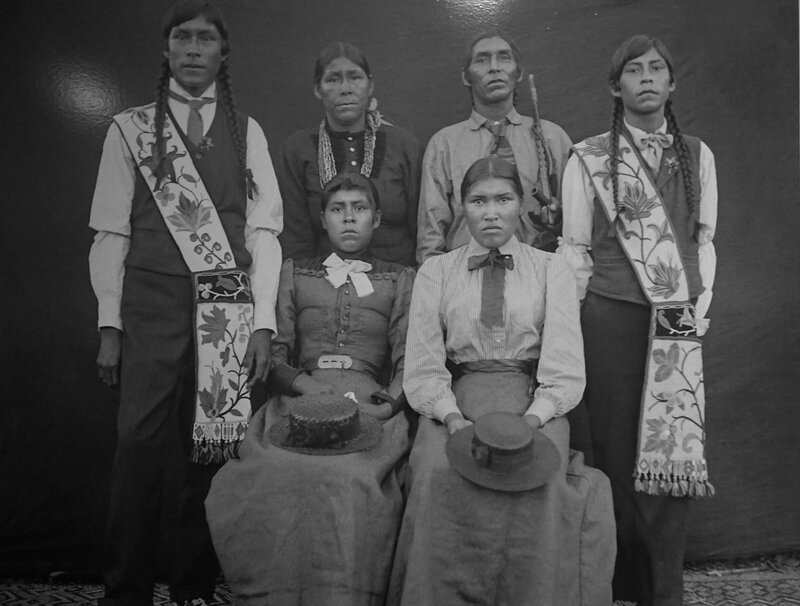 By the late 1800’s some Anishinaabeg girls would have been in residential schools set up to teach them the basic skills thought necessary to live in the new Dominion. 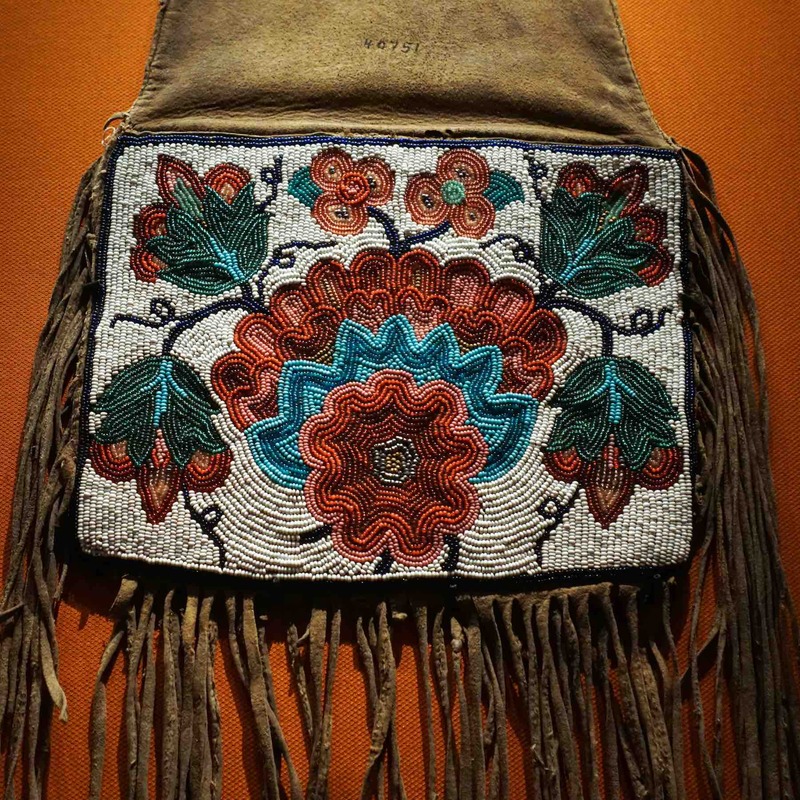 I wondered if this had an impact on Métis and Anishinaabe beading style. There were a number of objects in the horizontal display cases in the center of the room – like those shown in the images to the left and below – but I, unfortunately, left them for last and then found it difficult to get decent glare-free photos of the ones I stopped to look at. A return visit would have given me a chance to spend more time considering their place in the exhibit. From afar I spotted the display below and my mind said “a young girl’s fancy dress”! 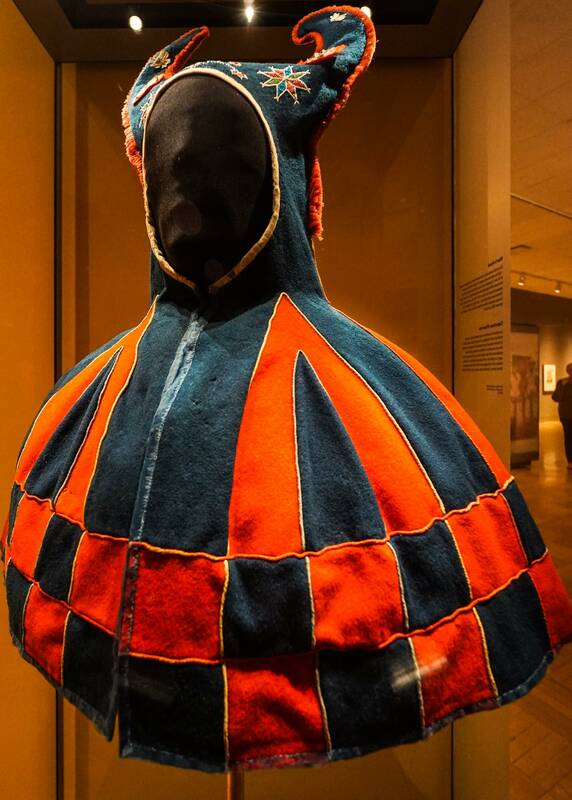 I had a duh moment as I read the identification card and learned that it was a man’s ceremonial hood. That explained the bumps coming out of the black front of the dress! And nearby were a couple of child cradles. However, the Algonquian word for “child” is papoos and that is the word that many will use! 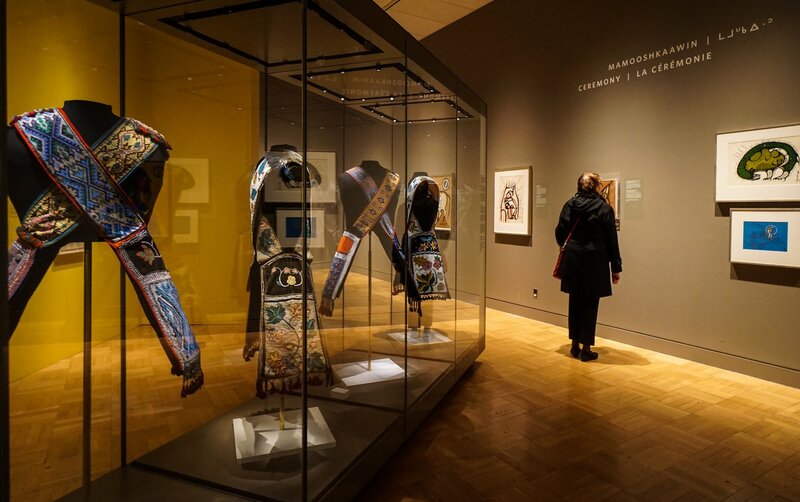 And finally this image – to me the most moving and intense moment of my visit as I stared into the eyes of the various members of this Ojibwe family – the two sons standing straight and proud with their beaded bandoliers, the two daughters dressed in the manner of those people from afar who came into their home and native land, and the mother and father, she with an elaborate bead necklace and he with a long-stemmed pipe. I realize that 150 years ago to get one’s portrait taken was a deadly serious affair and no smiles were allowed as the subjects froze for fifteen seconds and the photographer did his thing. 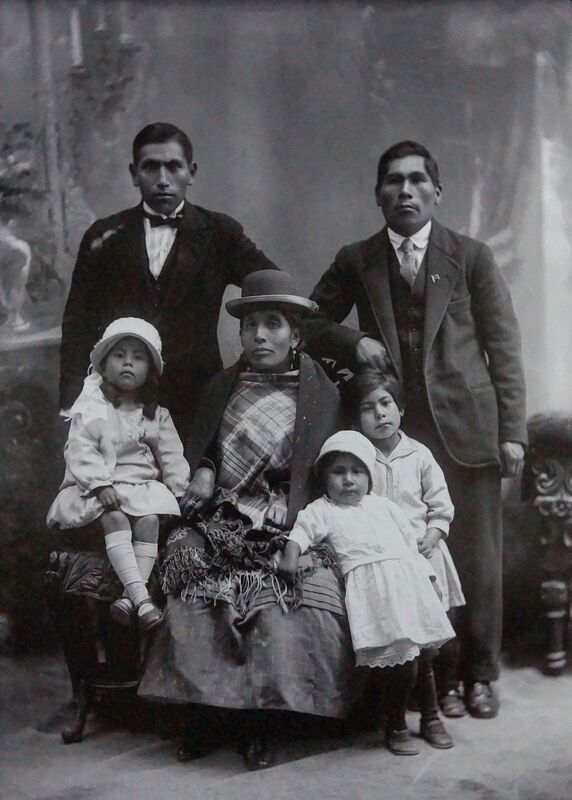 I am sure a family portrait in Toronto taken at the same time – whether of a well-to-do family or first-generation Irish refugees of the Great Famine – would have that same no-smiling look. But I felt something else here. Perhaps I was reading more into it than is there? Perhaps it is all the current talk about reconciliation? It is almost as if they were saying – “Now that you’ve come, what can we do together to make things right?” I am left wondering how their lives unfolded, and if they were able to live fulfilling and happy lives relatively free of the prejudice and discrimination that comes from being a minority or the loser of a struggle for land and power. I think I know the answer. And it made me think back to a day three years ago when I stood in a museum in La Paz, Bolivia, looking at a collection of images much like the one above. Engaging, unsettling, provoking wonder…an Anishinaabe family in Canada, an Aymara family in La Paz…both adapting to new realities. Admittedly the situations which these two Indigenous Peoples find themselves is not the same. While the Anishinaabeg make up maybe 2% of Canada’s population, the Aymara and the Quechua together make up 90% of Bolivia’s population and in Evo Morales they have had an indigenous President since 2006. 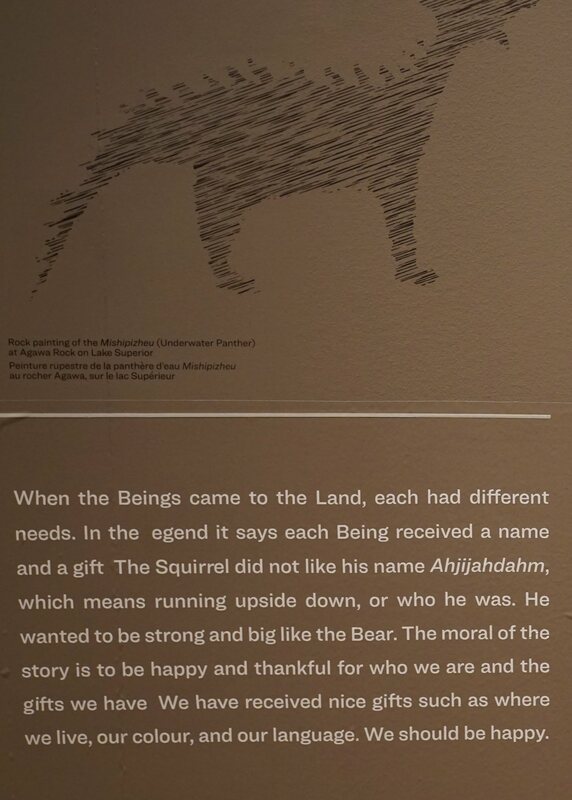 My one hour with the Anishinaabeg exhibit was too short and in writing this I am left wishing I could go back to fill in some of the blanks. Unfortunately, the exhibit is over. 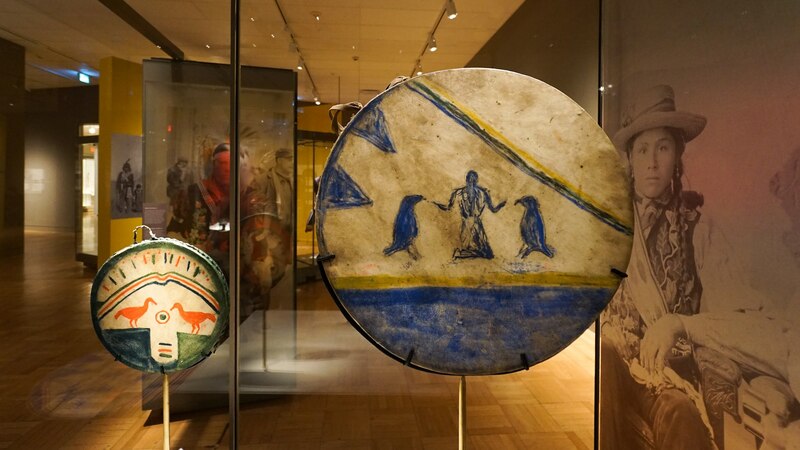 I wonder if the Royal Ontario Museum will send the collection to other museums or if all the exhibit items will just be put back on their storage shelves in the basement. 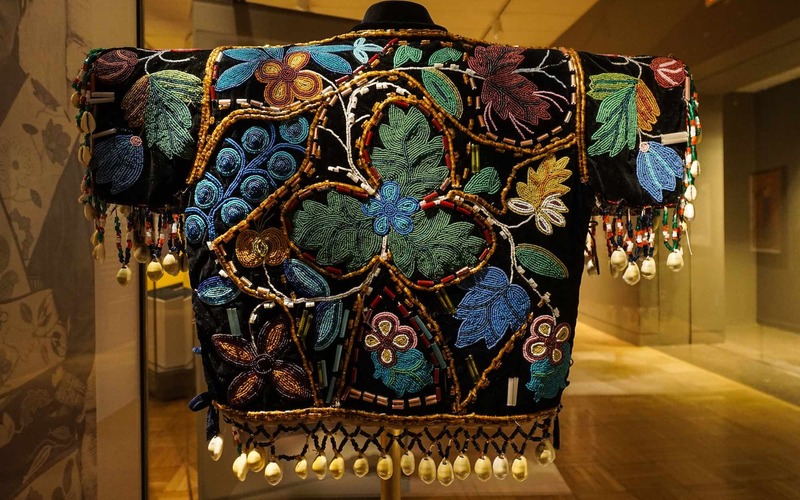 As limited a look of Anishinaabe culture as it was, it also provided me with yet another lesson on what happens when cultures meet … intersect … collide. 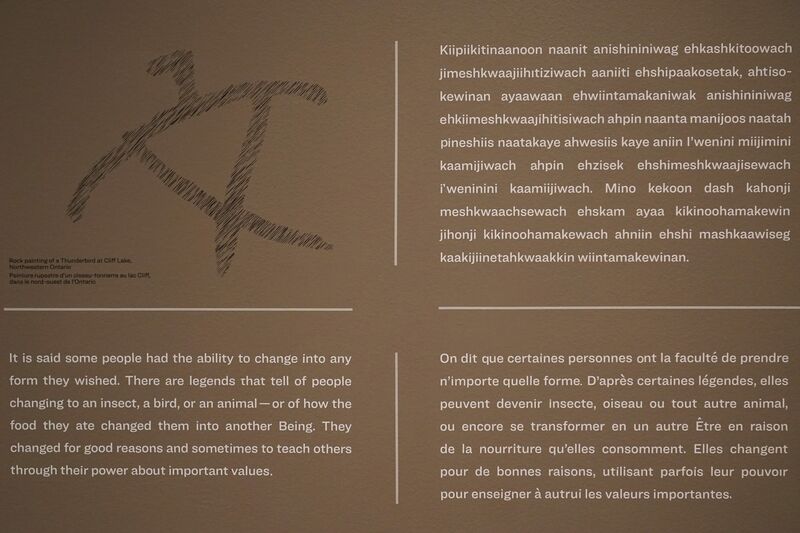 This entry was posted in Anishinaabek World. Bookmark the permalink. 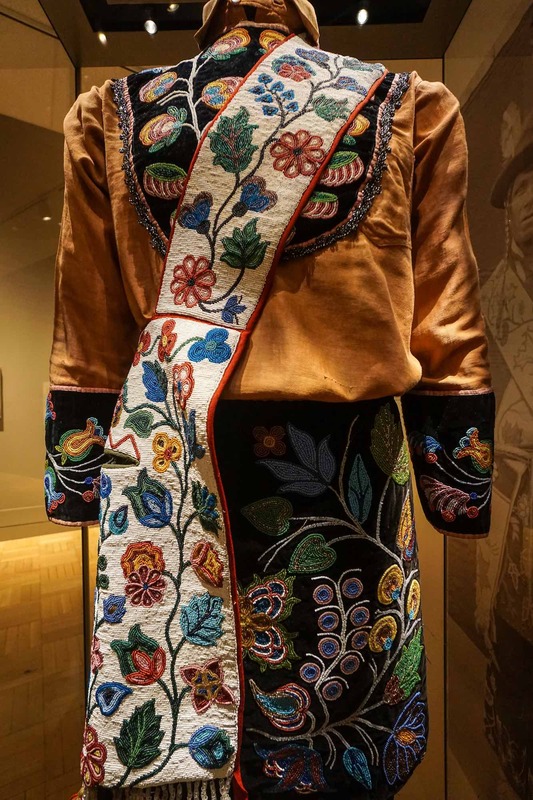 Thank you for this comprehensive visual tour of this exhibit – yes, I missed it, and I am a member of the ROM!!! I will share your beautiful coverage here. Vineca – good for you for continuing to support the ROM! It is a good cause – but I let my membership lapse after the glitzy rebuild and the destruction of my favourite space in the museum – the room with the Chinese temple murals and the wooden bodhisattva figures. Now it looks like a warehouse instead of the contemplative retreat room it was. Sticking the pieces of the Chinese General’s Tomb complex in a cramped L-shaped space also annoys me every time I go there!